The right light sources for your professional lighting projects. 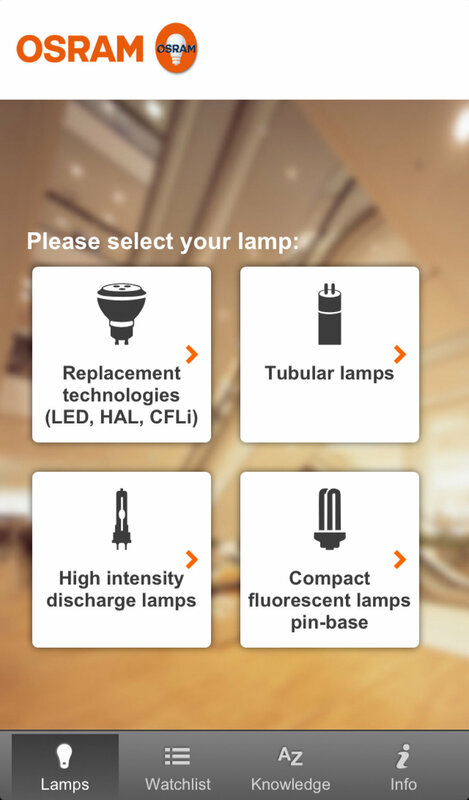 You can select the right lamps quickly and easily using the hugely flexible Lamp Finder Professional App. Whether you're on-site, at a project meeting, traveling or in the office: Pick out the most suitable products as quick as a flash and compare technical details of the available options. 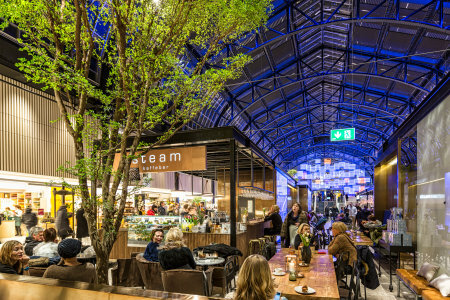 That's the way you can pick out the right light source for your projects either on your own or in conjunction with your customers. Use the app to compare LED, halogen and compact fluorescent lamps. You can also call up fluorescent and high-pressure discharge lamps. Click on "Details" to get more information on the lamps you have selected. The Lamp Finder Professional app provides you with practical functions to support your daily work. You can use the wish list to save selected light sources, and can send them to your own or any other e-mail address. You can find substitute lamps for commonly known incandescent bulbs and calculate the halogen reflector wattages you need using the "Replacement Technologies" pathway. To respond to the ever-growing demand for energy efficient solutions, the energy efficiency calculator provides a simple way of letting you know the savings in energy consumption made by your chosen lamps as compared to comparable standard lamps. 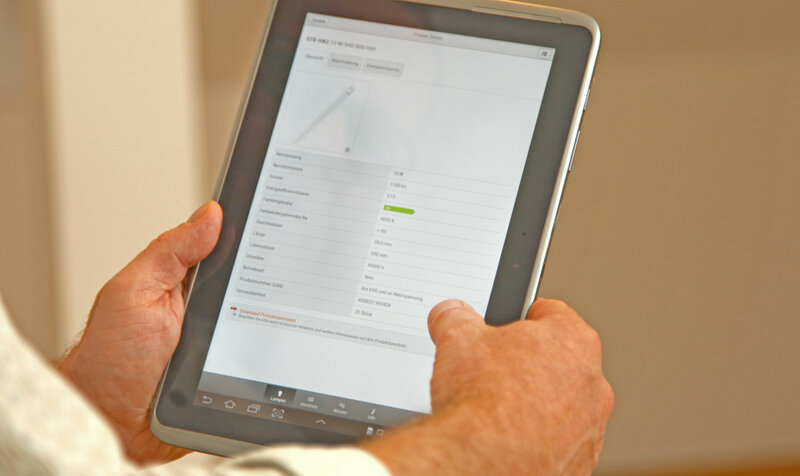 The Lamp Finder Professional App offers a complete socket selection. The product detail pages offer comprehensive technical information and a download for the data sheet. 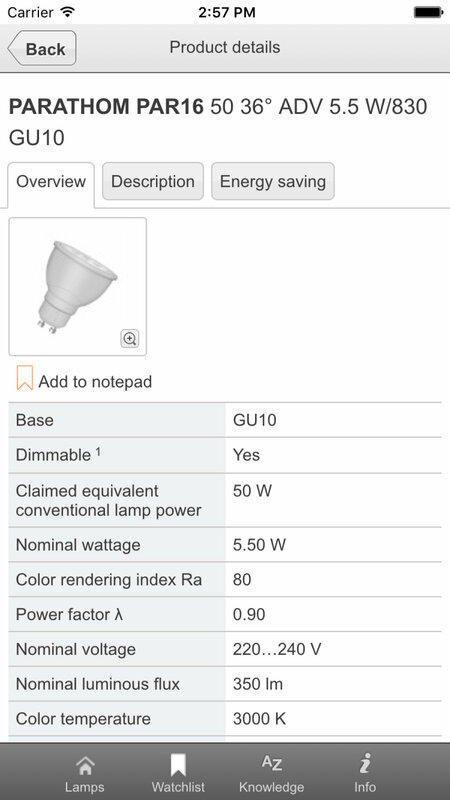 Calculate the energy savings of your selected energy efficient bulb compared to a comparable standard lamp. The start screen of the Lamp Finder Professional App. 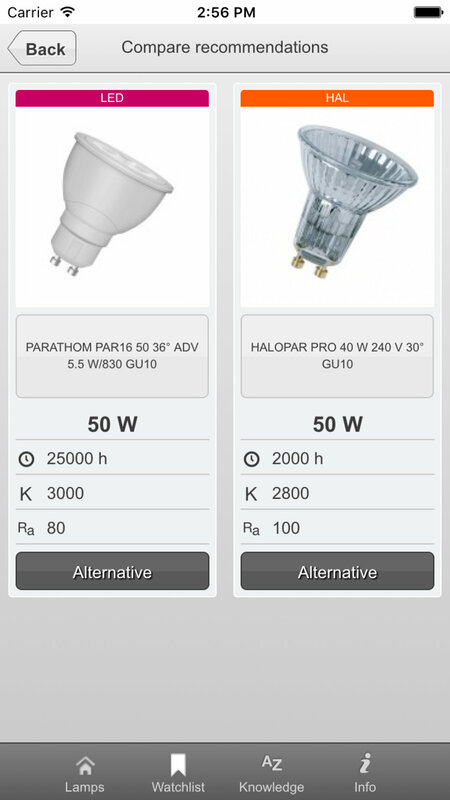 Compare the technical data of lamps of different lighting technologies. Product details are displayed in a convenient list view.